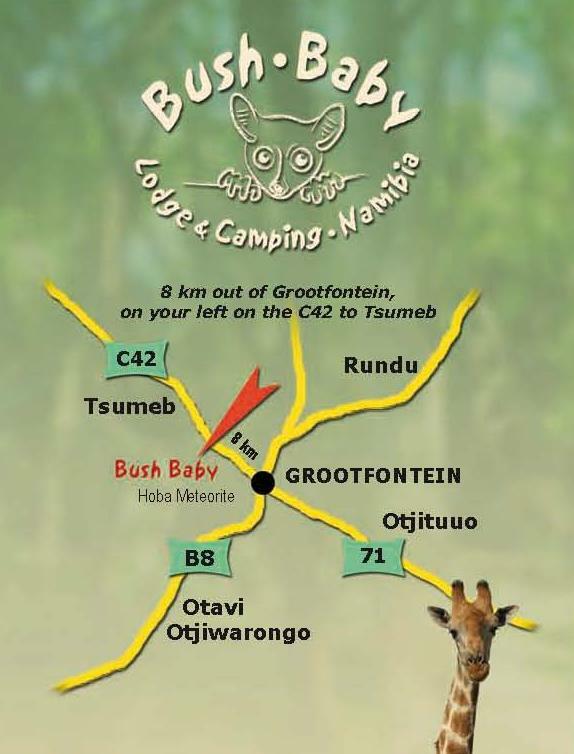 Bush Baby Lodge & Camping is an ideal place to stop on the way to or from Etosha to Northern Namibia, Caprivi and Bushmanland. 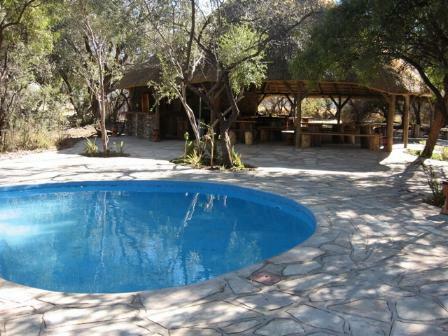 It is situated in the heart of a 3 000ha farm in the bountiful bush savannah and our landscape is filled with variety. 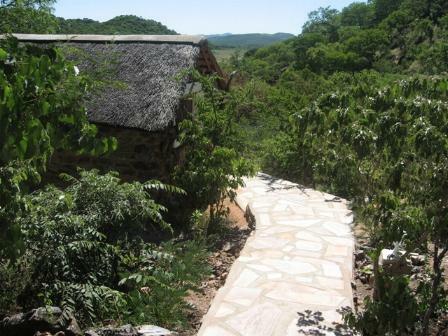 Hosts have big open fields with lots of game, mountains with sensational views over the wide African land. Together, the grazers and browsers make up 22 different species. Among them are; Hartmann and Burshell zebra, eland, blesbok, springbuck, black and blue gnu, impala, waterbuck, giraffe, and many more. Both the animals and the landscape can be observed during a game drive, which can be booked in advance or upon arrival. A great way to observe the animals is to nestle yourself at our floodlit waterhole’s. The aim of Bush Baby Lodge & Camping is to give our guests the change to taste Africa by keeping everything as natural as possible, with an appreciation for luxury as well. 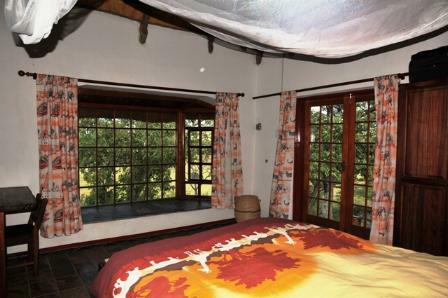 Hosts serve meals according to booking and we sell handmade crafts, fire wood and game meat. Laundry and internet services are available on request. Day tours to all surrounding tourist attractions can be arranged in advance, i.e. : The Hoba Meteorite, Kalkfontein (lion farm), local museums, Otjikoto Lake, Etosha National Park, and many more interesting places. Bush Baby Lodge & Camping management with their team will see to it that the guests experience a sense of complete well-being; a truly unforgettable adventure. The Lodge has five double rooms. Each room has its own bathroom and either a double or two single beds. You can enjoy the evenings on your private porch overlooking the savannah plain. The rooms are tastefully decorated and serviced daily. The evenings can also be enjoyed at the bar, big fireplace in the garden, or you can just stay seated after having dinner in our open air dining area. No matter what you choose, you will have the incredible view of an authentic Namibian savannah plain. During the day one can see many animals on the plain, and at night, the floodlit waterhole attracts wildlife such as rhinoceros, red lechwe and reedbuck. The Lodge is constructed on a hill made up of natural stones found on the farm; therefore blending perfectly into its environment. 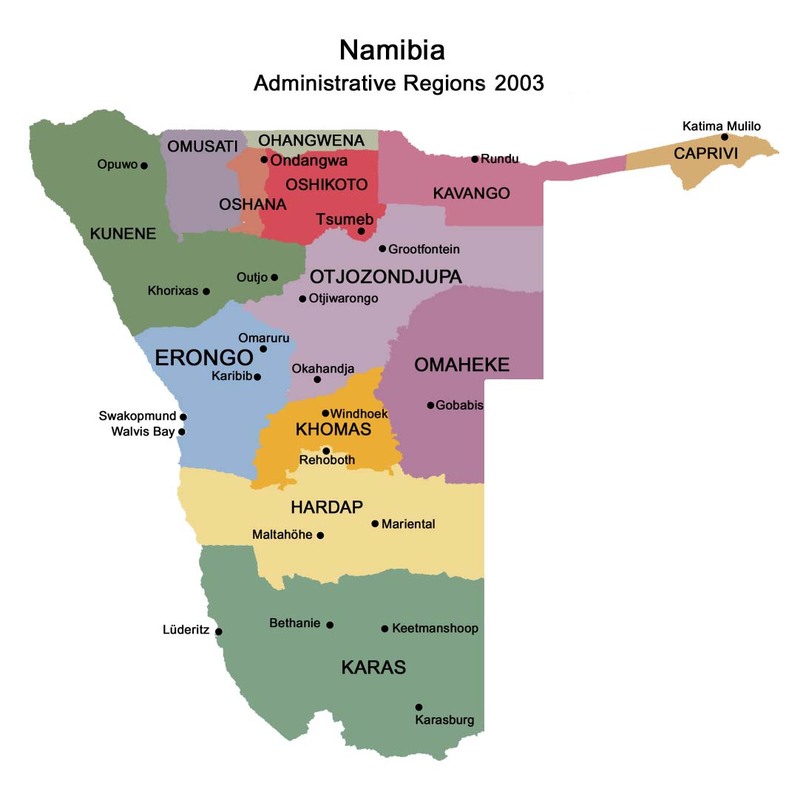 You sure will experience pure stress-relieving crisp Namibian air and awesome sights. 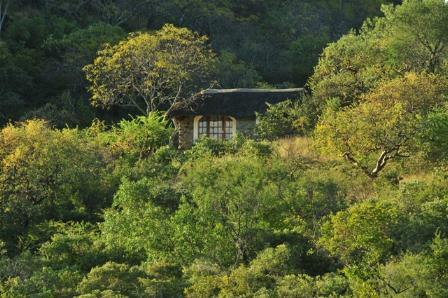 New Bush Bungalows are situated near the lapa. 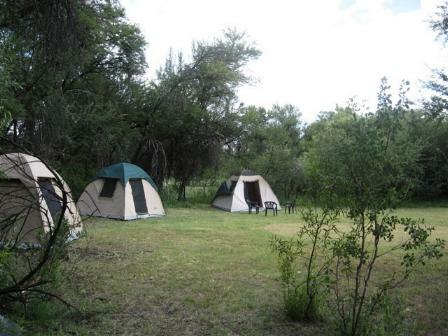 Here you will have a real peaceful African bush experience. 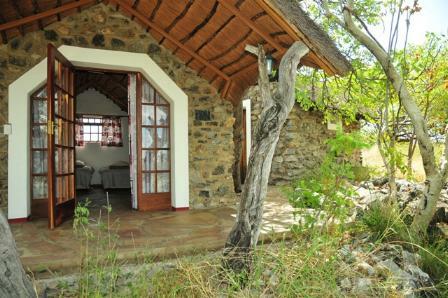 There are five Bungalows, each with two single beds and en-suite bathroom. 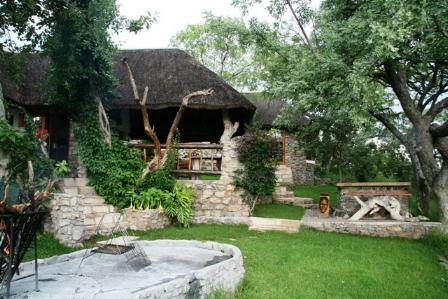 The Bungalows are within walking distance from the Lapa which consists of a bar, swimming pool, fire place and dining area. Also within walking distance is a floodlit waterhole were one can observe the different species of game. 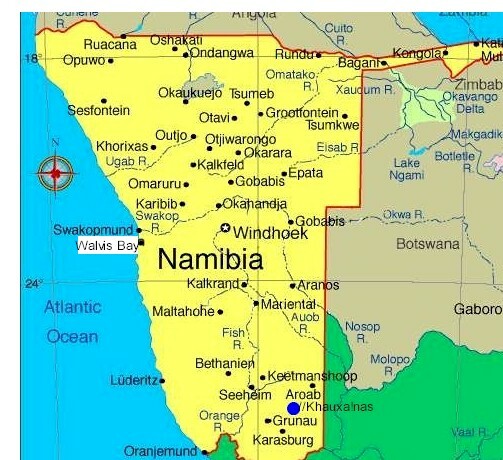 For families who visit Namibia we have a self catering flat which consists of two bedrooms, with two single beds each, bathroom and equipped kitchen. There is also a separate room with two single beds and bathroom. The flat can thus accommodate a family of six. Fire place available. The lounging area of Bush Baby Camping consists of a lapa with a bar, swimming pool and a big fire place, close to a floodlit waterhole. Guests can observe animal species and many bird species. Make sure to look up, some endearing bush babies may be seen leaping around in the trees at night. 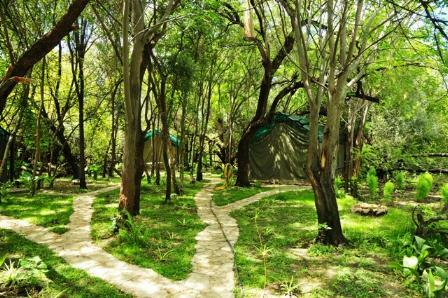 The three Luxury Tents are available in the midst of a forested area where tropical plants grow and birds and small mammals visit from time to time. A natural canopy makes the area shady and cool at all times. 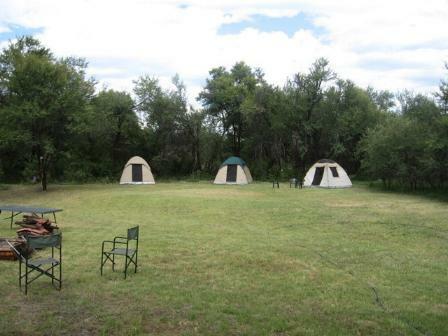 Each of the Luxury Tents has its own open air bathroom, and two single beds. Small fire places by the tent invite guests to spend their evening leisurely. The camping field invites campers to set up their tent on one of the designated sites where power and water supply points are made available. 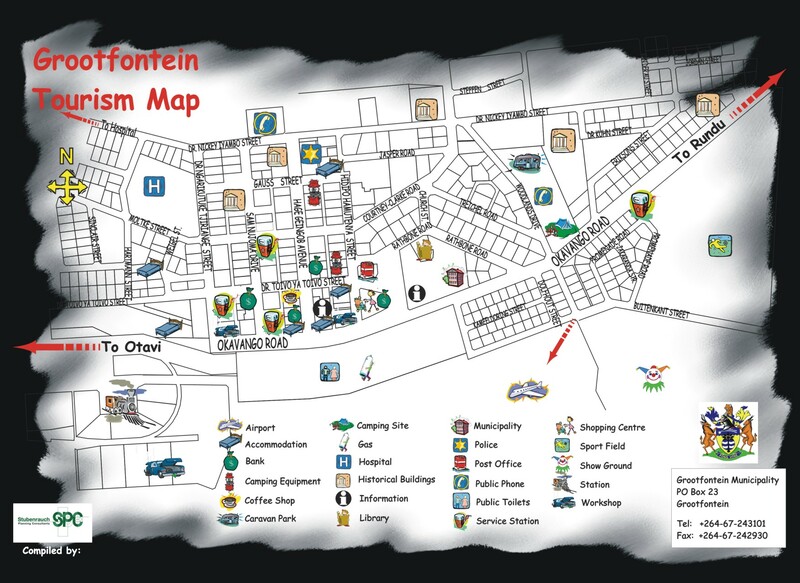 There is an ablution block with several toilets and hot showers within a stone’s throw away. There is now a game walk of 3.5 km, guests can observe game and bird species on the walk and it can also be done by mountain bike.